We had to use special advance drying equipment for a water damage in a school. It allow us minimize the time the school was closed. The area requiring the drying equipment was 3 classrooms, main office, nursing office, 2 hallways and cafeteria. This Rockford homeowner took advantage of us being a preferred vendor for pack-out and content cleaning for Allstate. We were able to pack-out their content, clean, store them in a climate controlled environment, and return them. We also inventoried the non-salvageable and salvage contents to both homeowner and insurance company. This Batavia homeowner took advantage of us being a preferred vendor for pack-out and content cleaning for Allstate. 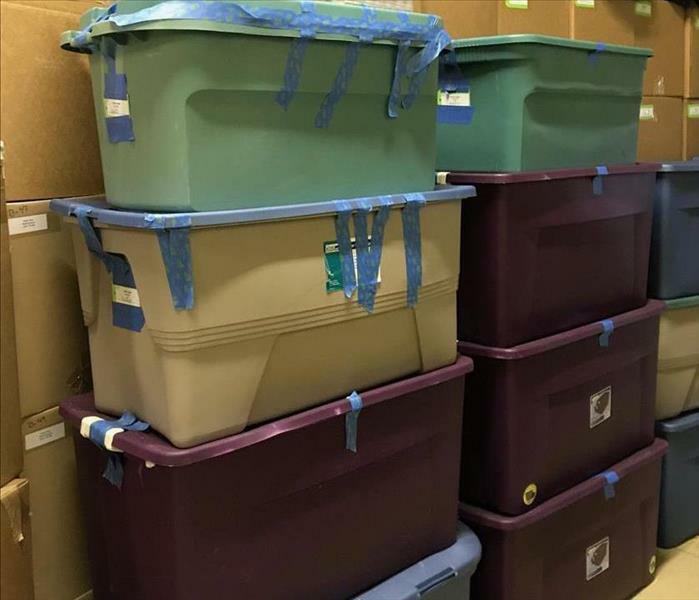 We were able to pack-out their content, clean, store them in a climate controlled environment, and return them. We even had to move and pickup contents at the leased house they were living while their house was under reconstruction. The owner of a home in Marengo call us because there insurance agent recommended us. 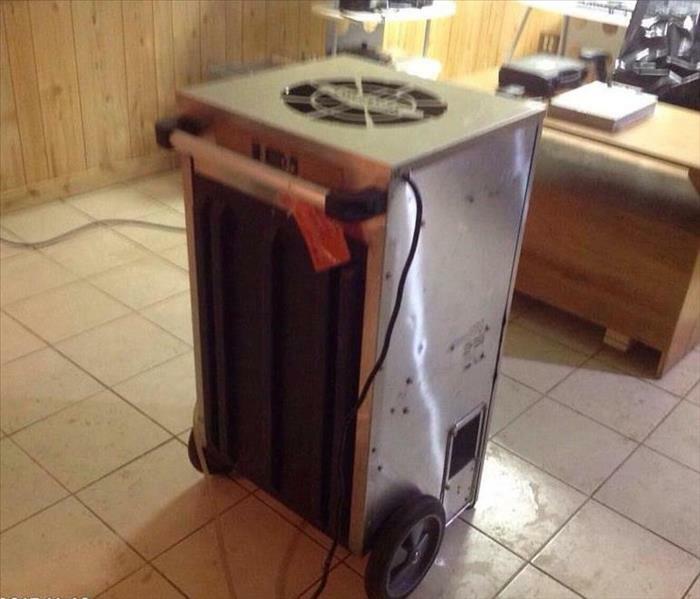 They had a water damage due to ice damming. It was good that she call us rather than doing a DYI job by themselves. We found mold behind the walls that required mold mitigation. Another happy customer. We were SERVPRO Hero's. 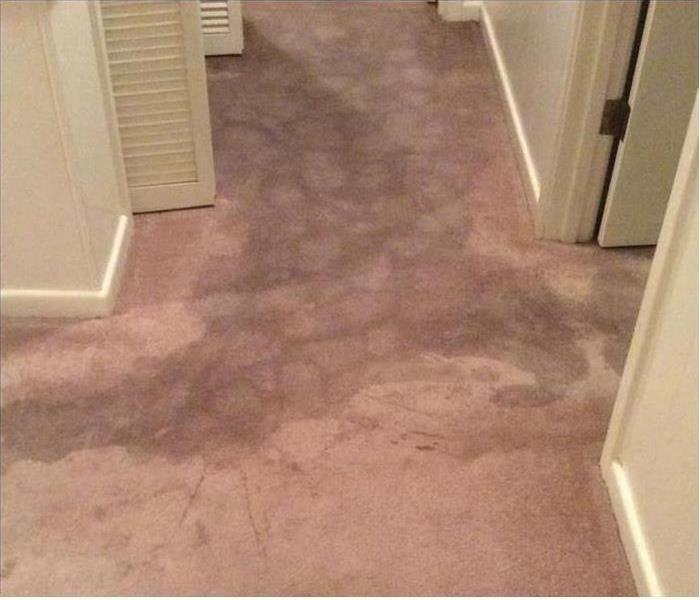 We had done a water damage cleanup for this customer. 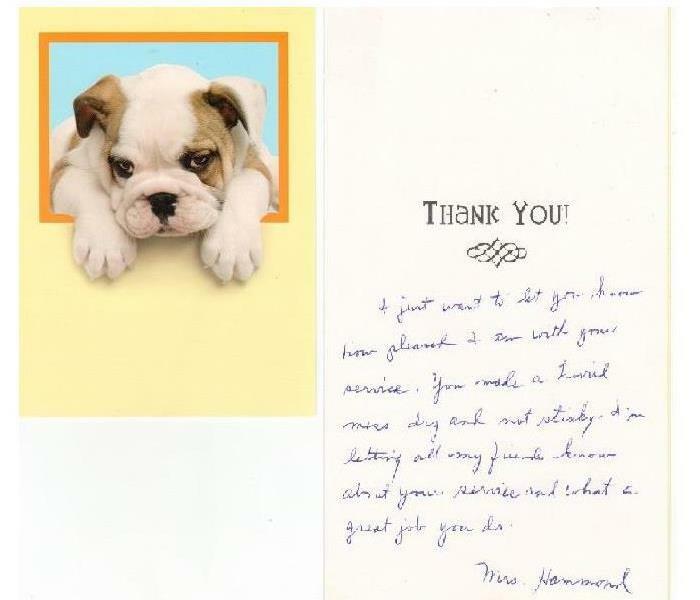 A few days after we completed the job this thank you card came in the mail. Our crew was also happy that we provide superior customer service. 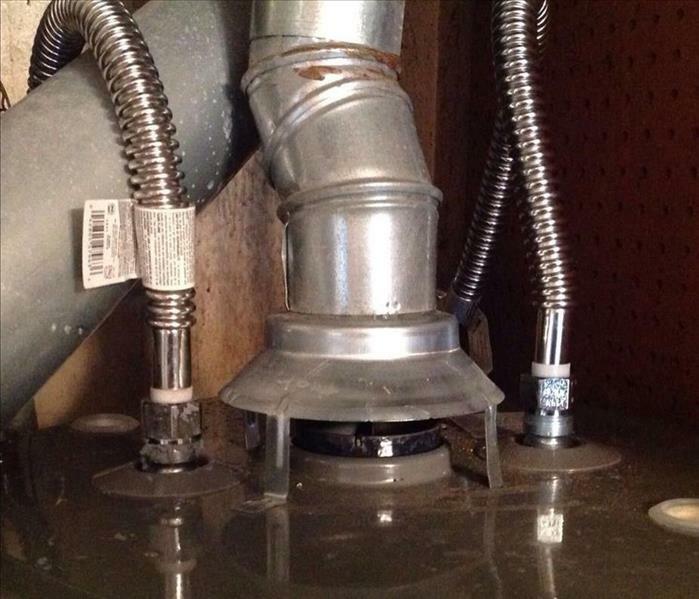 This family’s Cary residence experienced serious water damage after the water heater burst. SERVPRO of Southern McHenry County has the expertise and equipment to mitigate residential water losses just like this one. In this particular situation, we extracted the water then dried the carpet and walls in place. The family was very grateful to be able to use the space again within a matter of days! Temperatures have started to heat up, which means your home is at a greater risk for mold growth. Mold spores can grow in temperatures ranging from 32 to 120 degrees Fahrenheit. The optimum temperature range for mold growth is between 70 and 90 degrees Fahrenheit, a common temperature range in our area. As the summer weather finishes up, it is time to be even more cautious of any possible moisture or water damage on your property. In order to reproduce, mold spores require moist or damp areas. 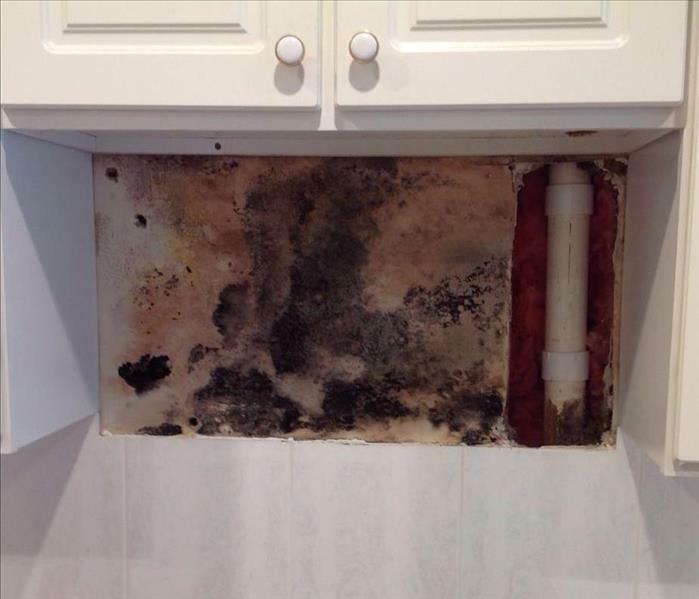 Excess moisture in bathrooms, kitchens, and laundry rooms are prime areas for mold to grow. Also be on the lookout for flooding, leaky pipes/windows/roof, etc., and call a professional right away should any of these problems occur. SERVPRO of Southern McHenry County has highly trained and experienced crew members ready to make it "Like it never even happened." Our production technician wearing his protective personal equipment prior to entering a home with mold growth. SERVPRO of Southern McHenry County knows that safety is of the utmost importance and performs our services to the highest standards. This family’s Cary residence experienced serious water damage after the heavy July Rains 2017. 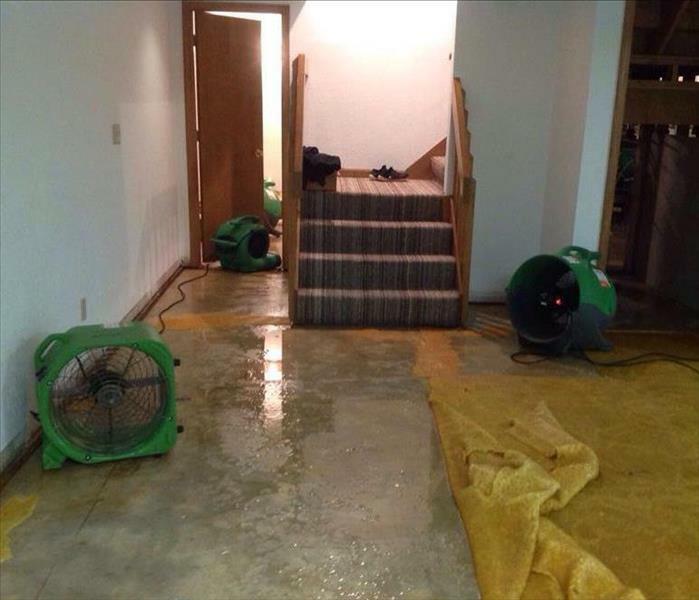 SERVPRO of Southern McHenry County has the expertise and equipment to mitigate residential water losses just like this one. In this particular situation, we extracted the water then dried the all of the affected areas. 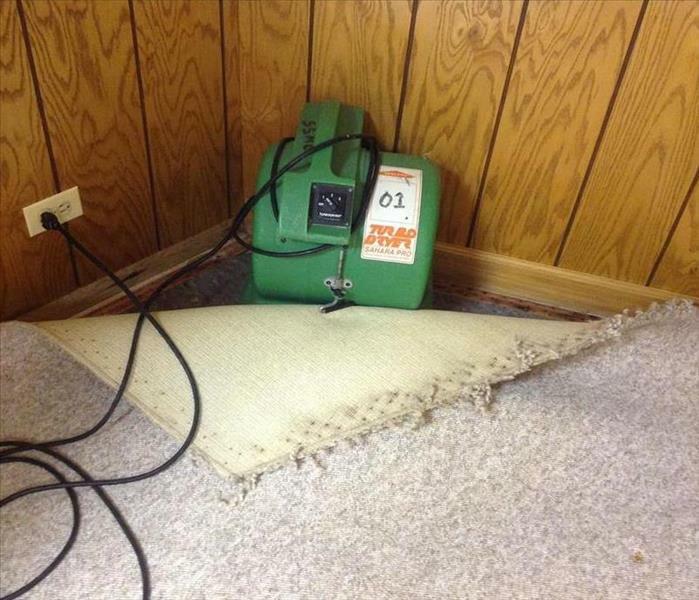 The piece of equipment you see with the carpet connected to it is floating the carpet to dry it. Before placing the air mover there we removed the carpet pad per IICRC guidelines. The family was very grateful to be able to use the space again within a matter of days! 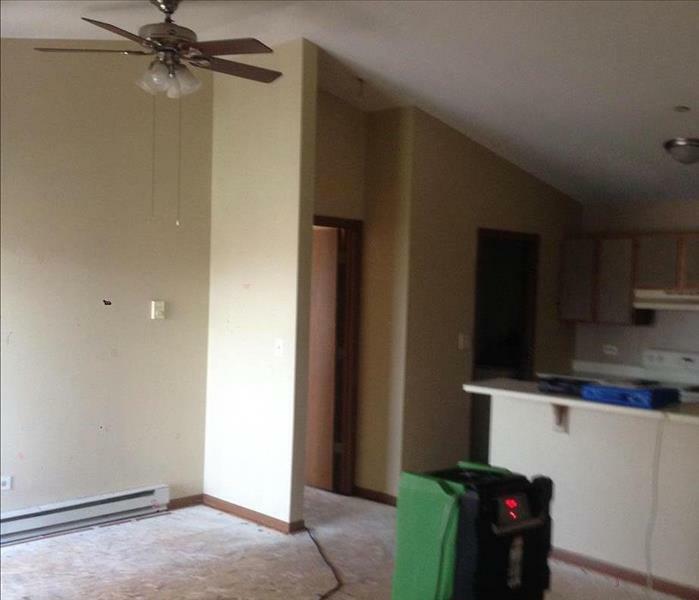 SERVPRO of Sothern McHenry County specializes in restoring contents damaged by water, fire, or mold. Our expertise and “restore” versus “replace” mentality can help you save money while preserving precious keepsakes that can’t be replaced. We pretest your belongings to determine what items we can restore to pre-fire condition. Along with that we can store your belongings at our warehouse until the reconstruction is completed. 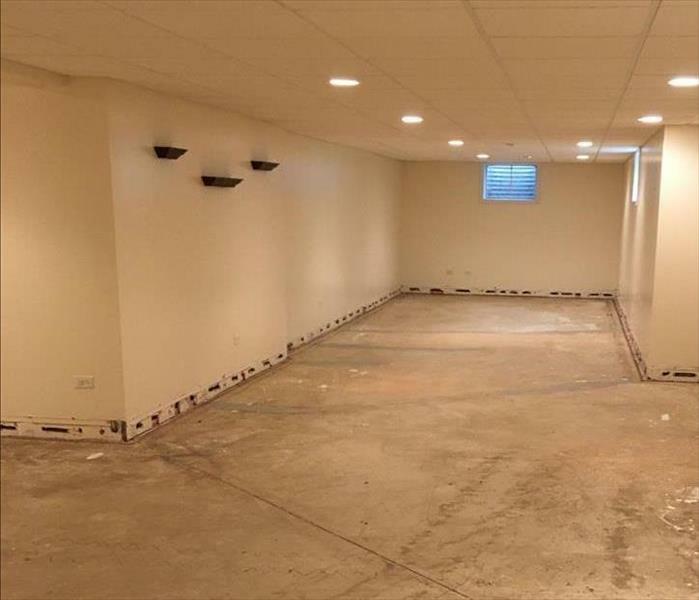 This photo was taken during a mold job completed in Cary, IL by SERVPRO of Southern McHenry County. 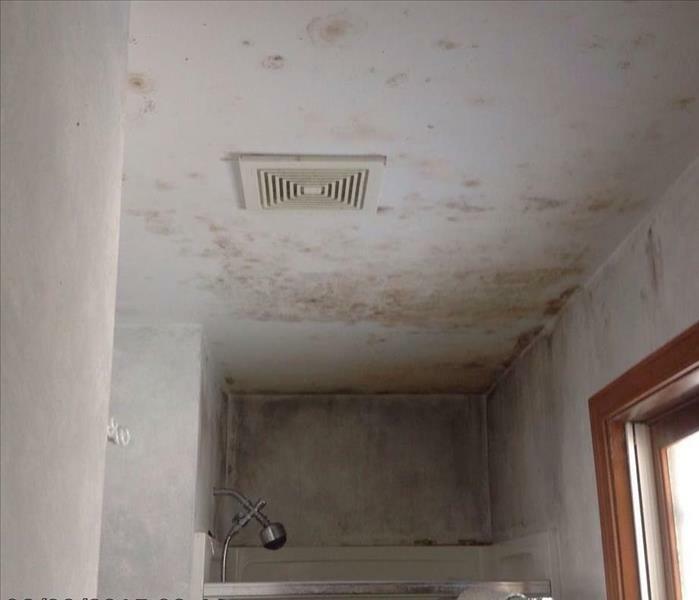 The mold shown in the photo had spread to two rooms in the customers home. This family’s Cary residence experienced serious water damage after the heavy July Rains 2017. SERVPRO of Southern McHenry County has the expertise and equipment to mitigate residential water losses just like this one. In this particular situation, we extracted the water then dried the all of the affected areas. The piece of equipment in the middle of the room is one of our larger commercial dehumidifiers it is capable of removing 133 pints of water out of the air per day under the perfect conditions. The family was very grateful to be able to use the space again within a matter of days! This commercial rental property had their water pipe break days before it was ready to be moved in. After the water was extracted it was time to let the air mover and dehumidifiers work. This photos shown how the professional drying are placed to dry the area. SERVPRO of Southern McHenry County received the 2017 membership year tag for the Huntley Chamber of Commerce and Industry marking 14 years of membership. SERVPRO of Southern McHenry County continues to provide the best in fire and water cleanup and restoration services for Southern McHenry County and beyond. 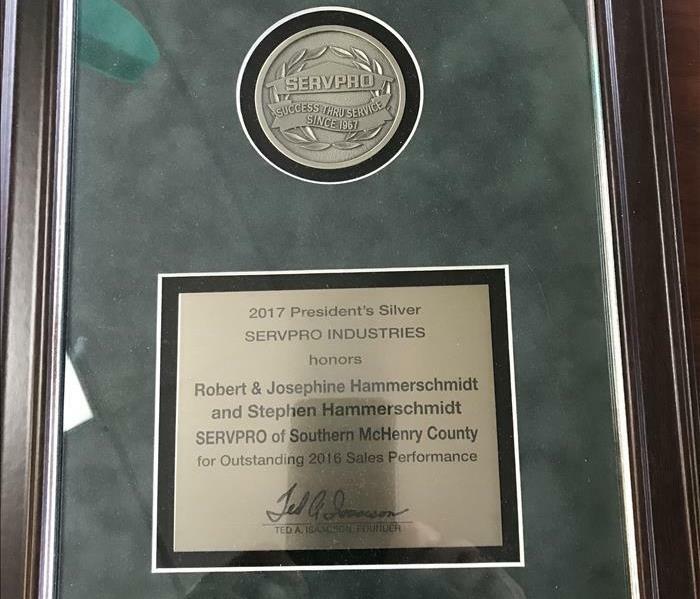 SERVPRO of Southern McHenry County received the 2017 President’s Silver for Outstanding 2016 Sales Performance! SERVPRO of Southern McHenry County continues to provide the best in fire and water cleanup and restoration services for Southern McHenry County and beyond. It's the water or mold that you don't see that can cause the most damage including secondary damage such as mold. 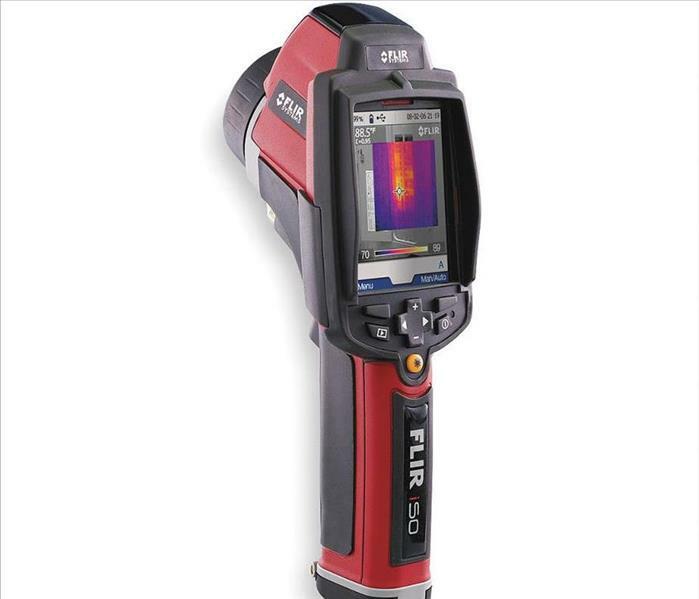 SERVPRO of Southern McHenry County utilizes advanced technology such as this infrared camera to test for this unseen water without causing damage to your home or business. The refrigerator is one of the hardest working appliances around the home, so when one breaks suffers a leak, the experience can have consequences. This Cary home experienced a refrigerator water supply line break flooding the kitchen and basement while the homeowner was at work. When the line is damaged and needs replacement there are a few things to keep in mind. For instance, one of the factors at this point would be to choose a line material that will offer durability and long lasting utility. In terms of materials, plastic lines are the most cost effective. The biggest threat lies in these lines cracking. Another option is to go with copper water lines that yield superior sturdiness but are also more prone to kinkiness. CRYSTAL LAKE, Ill. -- It has been a very long couple of weeks for people who live in areas hit by severe storms. In Crystal Lake, it started raining heavily around 3:30 p.m. on Sunday, July 23. At least a few trees were down and neighbors said it just came out of nowhere. Then the power outage occurred 1654 homes went dark no electric. The water started to back up in the homes in some cases one foot deep. This home had about 1 inch of water in basement. 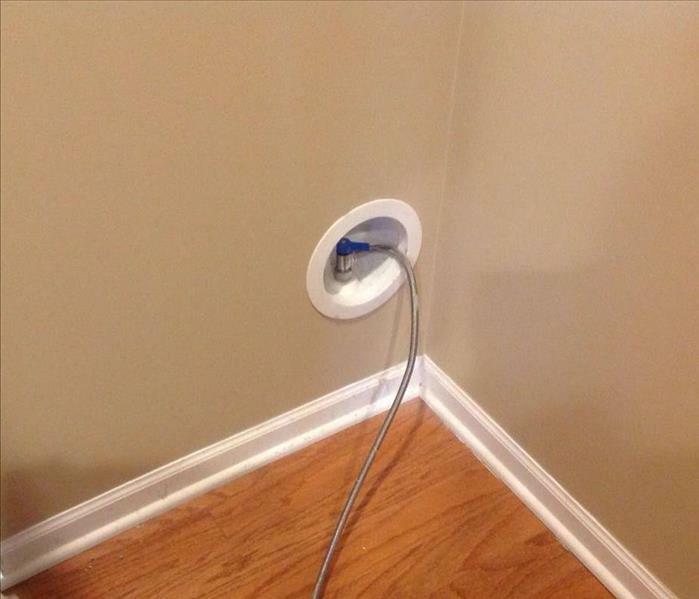 In the picture you will see that we were able to puncture holes in the wall to aid in drying process. During the drying process we were able to save the walls and saved the customer in the cost of reconstruction. 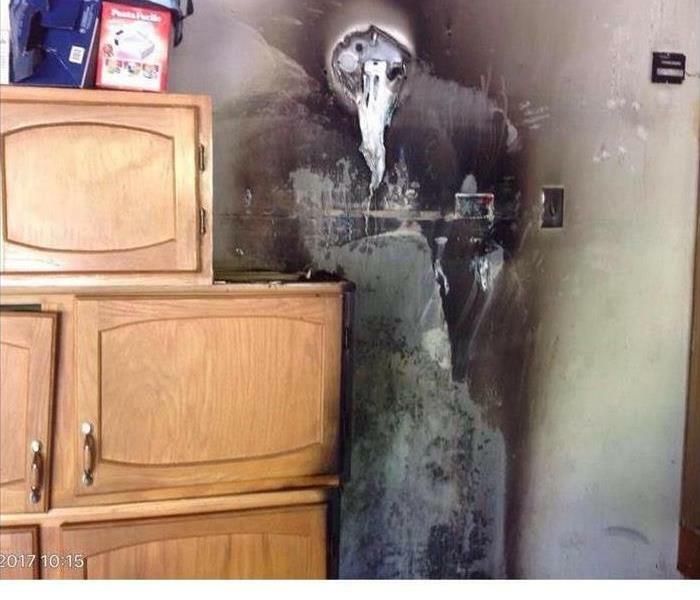 When something like this happens call SERVPRO of Southern McHenry County 847-516-1600. Unseen water can lead to mold and other microbial growth in your home or office. At the first sign of water, call your local SERVPRO of Southern McHenry County team that is faster to any size disaster. The Southern McHenry County storm event required SERVPRO of Southern McHenry County to get more specialized drying equipment. 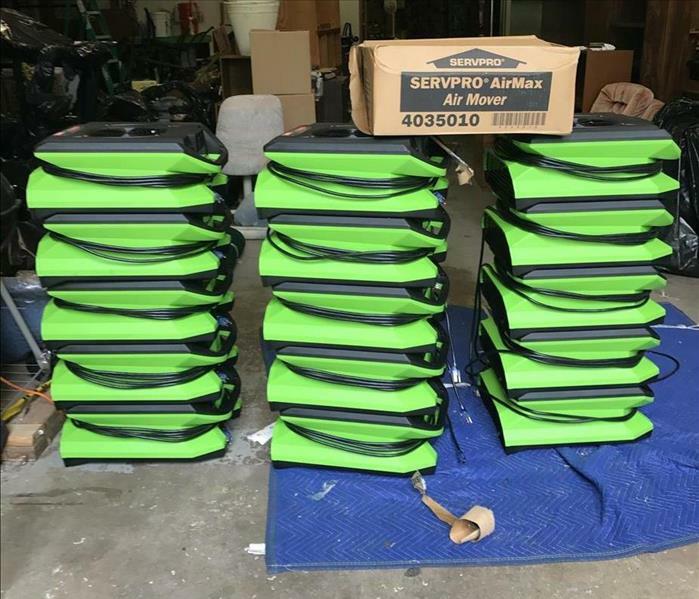 SERVPRO of Southern McHenry County is deploying the latest in drying industrial air movers. We are trying our best to serve this areas. Between the SERVPRO Storm Teams and SERVPRO of Southern McHenry County we should have sufficient equipment to handle this size of disaster. SERVPRO of Southern McHenry County is ready to help 24/7. Please call (847) 516-1600. Okay, most of us don’t pay a lot of attention to our toilet supply line — that metal pipe running from the wall to the toilet. We just assume that it’ll just keep doing its job forever. But there’s a hidden problem lurking in many of these gadgets that could be a broken line in the making and your own toilet might be getting ready to betray you. Manufacturers always made these lines out of brass or some other sturdy metal, and you could generally count on them providing years of trouble-free service as long as they were attached correctly. Well, today’s toilet supply lines usually have a cheap plastic nut on them. This is just asking for trouble, because there’s no way to tighten a cheap plastic nut sufficiently without stressing it to break. 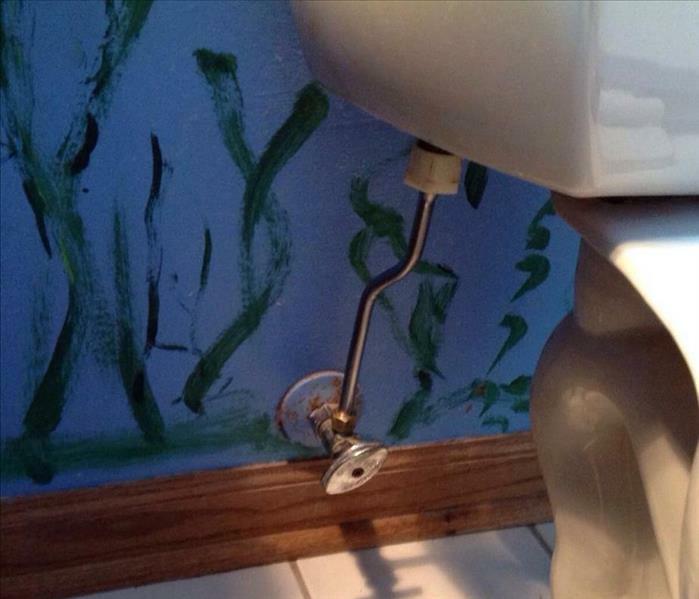 We received a call where a busted toilet supply line flooded the entire home and caused thousands of dollars in damages, all because of one cheap little part. This is a picture of our retention pond in front of our office. It is normally green grass. The pond has not drained out at all over the last 3 days. When these retention ponds fill there is going to have water backup in the houses and businesses. 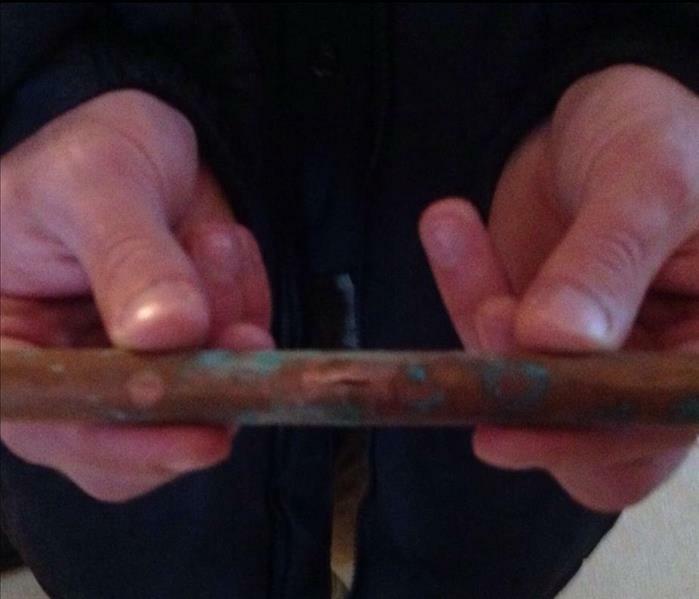 One of the most common things to happen to a home during a cold snap is water damage caused by frozen pipes. Even where extremely cold weather is normal in winter, pipes freeze and cause all kinds of problems. Problems come up when frozen pipes thaw; cold weather makes pipes brittle and frozen water has less volume than running water. The pipe breaks due to the cold, water starts running and then you've got a mess on your hands. Pipes can freeze in 2 main areas – water coming in and water going out. You know water coming in is frozen because nothing comes out the tap. Frozen outgoing pipes from showers, toilets and sinks are a bigger problem because these will back up into the house; that's the reason it's always recommended to keep a little water dripping into the sinks and opening the cabinet doors under the sink ... running water doesn't freeze as easily as standing water. Every year clothes dryers spark fires. Lint and other debris can build up in your dryer vent, reducing air flow to the dryer, backing up dryer exhaust gases, creating a fire hazard. Clothes dryers are an appliance that make our lives easier but we often take them for granted. We shouldn't, we need to maintain them and most importantly have their vents cleaned. The first sign of troubles that you might have a clog is when your dryer stops drying your clothes in one cycle. That means the dryer works harder and heat builds up and that is what can lead to a dryer vent fire. SERVPRO can clean these vents. Please call 847-516-1600. Ice dams occur on heated buildings with sloping roofs in cold climates with deep snow accumulation. Ice dams on roofs form when accumulated snow forms an insulating layer under cold conditions that would cause the freezing point to be within the snow layer, if it were not subject to melting. Instead, building heat coming through the roof's surface melts the snow resting on it. 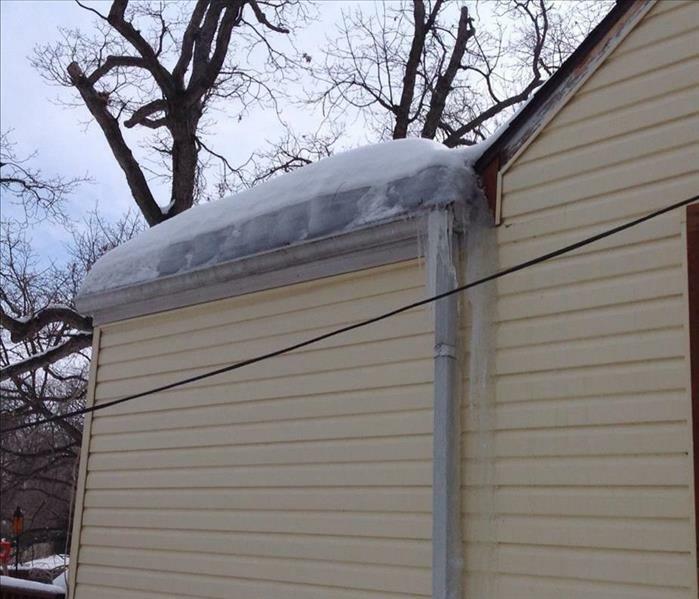 This causes meltwater to flow down the roof, until it reaches below a place on the roof's surface that is below freezing—typically at the eaves where there is no building heat. When the meltwater reaches the frozen surface, ice accumulates, growing a barrier that impedes further passage of meltwater off the roof. Ice dams may result in leaks through the roofing material, possibly resulting in damaged ceilings, walls, roof structure and insulation, damage or injury when the ice dam falls off or from attempts to remove ice dams. This garage had a cigarette thrown into a plastic waste can that left a sooty and charred mess behind at this Algonquin home. SERVPRO techs work to quickly eliminate the migration of smoke and odors to the main house by washing the ceiling, floors, and walls. This was done as soon as the debris is removed and it is safe to work inside. Homeowner from Lake In The Hills comes home and finds their finished basement destroyed by a leaking hot water heater. The picture shows the hot water supply line after it was replaced. Your water heater has a cold water line that constantly feeds water to the water tank as you use the hot water. Another line leads from the tank to supply your home with hot water for showers, baths, dishwashing and laundry. If either of the water lines show signs of corrosion or begin to leak you should replace one or both. Use the flexible water lines found in water heater installation kits or supply lines required by your city's building code. This Rockford, IL home flooded when the area received a large amount of rain in a short time. The sump pump got overwhelmed and could not keep up with the amount of water that was coming in. As you can see, water started crawling up the walls. Contents were affected by the water. Our crew arrived on site to extract the standing water, clean and dry and affected contents and put them in plastic containers so they wouldn't be affected by water should this happen again. We dried all affected structural materials and cleaned the flooring. Our crew worked quickly to stop any secondary damage. 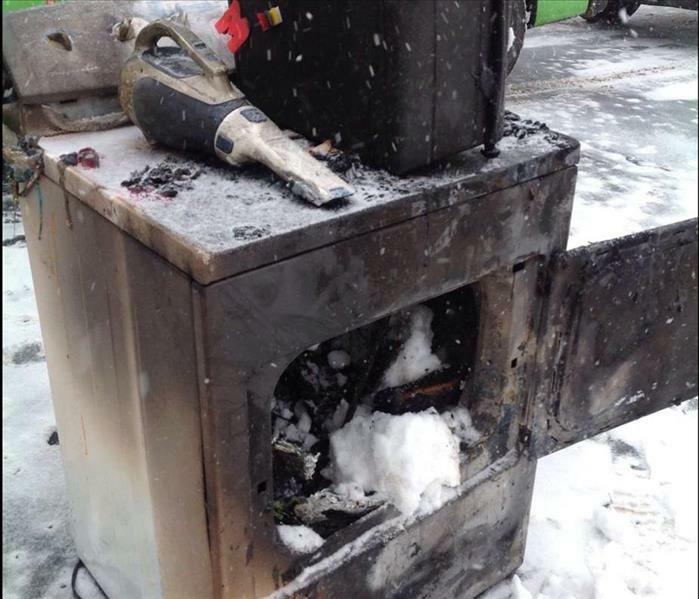 This fire was caused by dryer malfunction was located in Crystal Lake, IL. Before we could start the fire mitigation the insurance company had the cause of fire investigate. 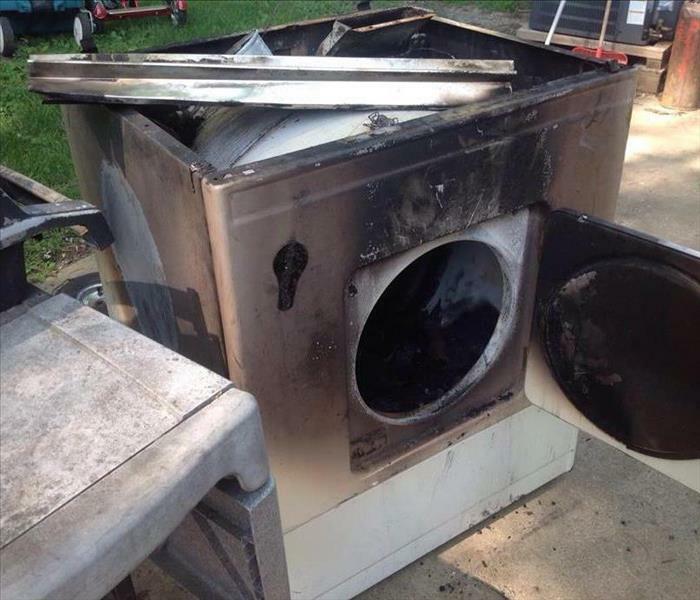 The insurance company after it’s investigations had determined that the dryer malfunctioned. 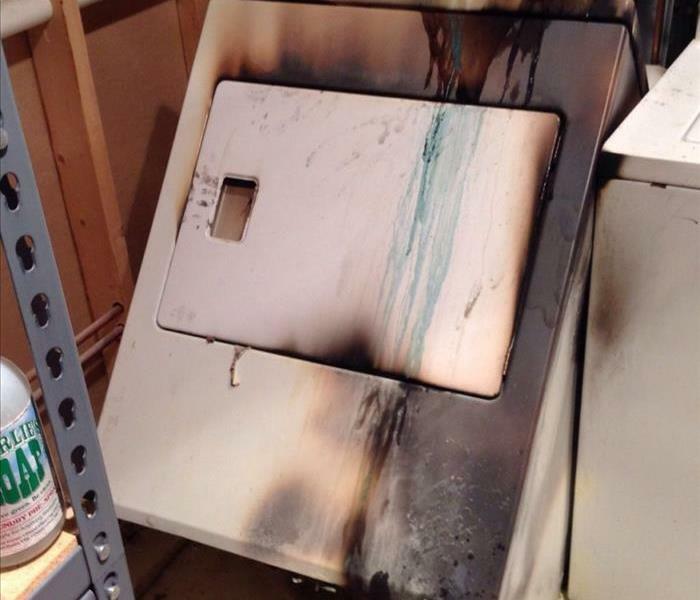 Because the dryer started the fire and it was still under warranty the insurance company was able to start a subrogation process. Subrogation refers to an insurance company seeking reimbursement from the person or entity legally responsible for an accident after the insurer has paid out money on behalf of its insured. In this case the insurance company was able to collect the full cost of repairs and cleaning from the manufacture. The insured was not even responsible for the deductible. A win win for everybody. It’s a cold winter evening and you decide to light a fire. Great idea! 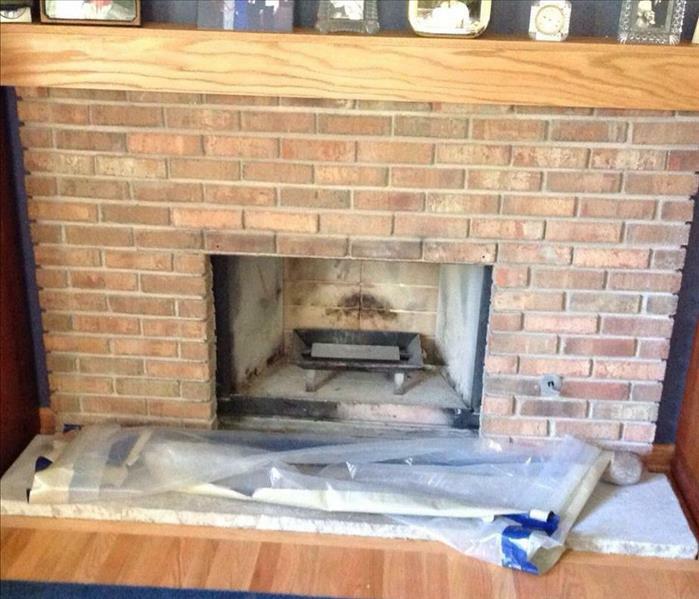 However, this homeowner was expecting that the smoke to go up the chimney and not come pouring into the family room. Ugh. You’re wondering now if this back puffing is caused by a serious problem, a fluke breeze or by Uncle George’s failed Boy Scout merit badge in fire starting. You suddenly realize I forgotten to open the fireplace damper. Smoke has gotten into the family room and rest of the house. How am I going to clean this soot up? It’s on the walls, ceiling, and floors. You look around and soot is on the furniture also. It’s time to call SERVPRO of Southern McHenry County at 847-516-1600. 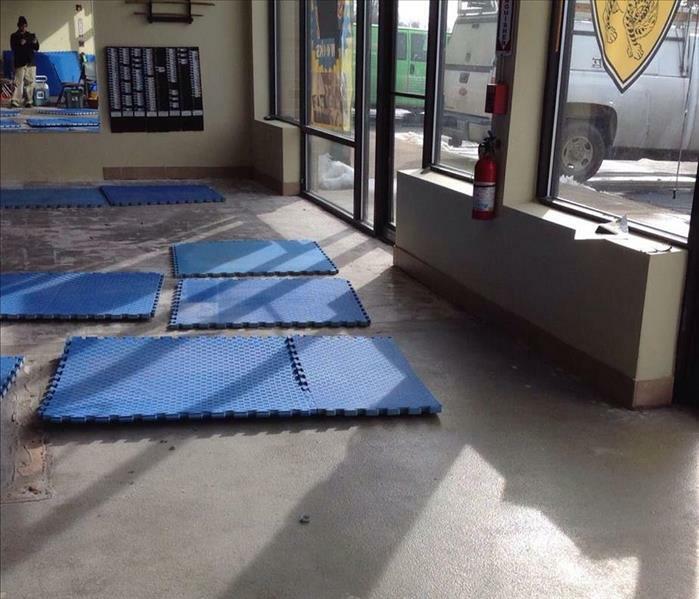 This Algonquin, IL business had the sprinkler system goes off because of freezing pipes. The call came from a management company over the weekend. We meet with both management company and business owner. We explained that all of the wet material needed to be removed and then place commercial grade dehumidifiers and air movers drying. Both the business owner and management company gave us the go ahead to start the job. The customer was able to open up within couple of days while the necessary construction and cleanup was still going on. The business lost only 3 days this was an unexpected plus for the customer. The clients and employees of this Commercial Property noticed a terrible smell in their building. Upon further inspection, a custodian discovered the source of the problem. 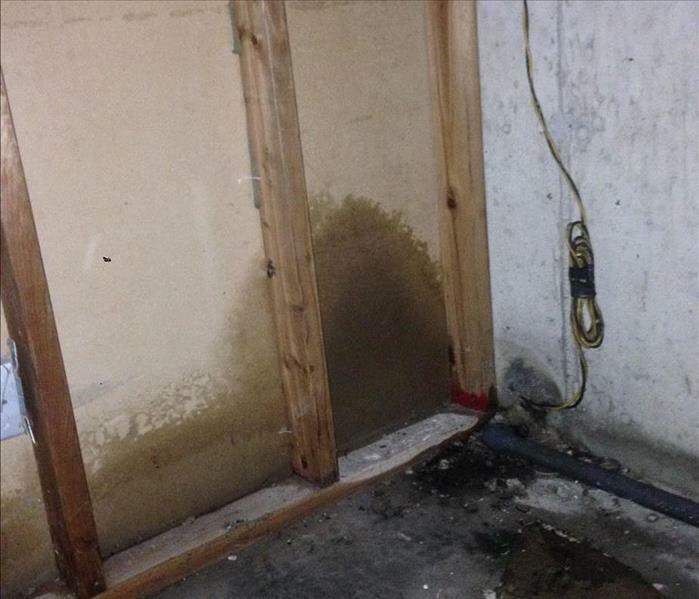 A sewer pipe had burst open in the basement and flooded the concrete floor with raw sewage. The fire started in the basement and quickly damaged structural materials. When allowed to enter the home, we initiated a demolition to clean up the interior prior to starting the fire damage restoration service. 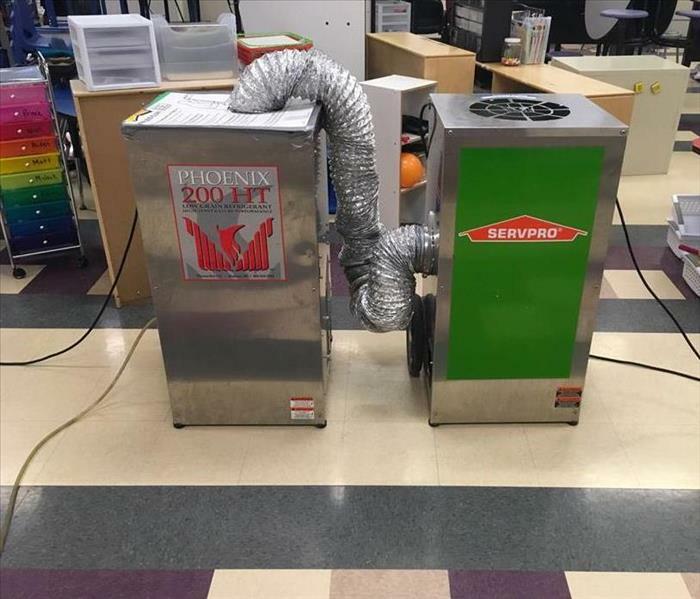 Our SERVPRO technicians set up ozone machines and air scrubber to reclaim acceptable levels of indoor air quality. Deodorizing the affected areas completed the initial phase of our fire damage restoration service in this Belvidere IL. 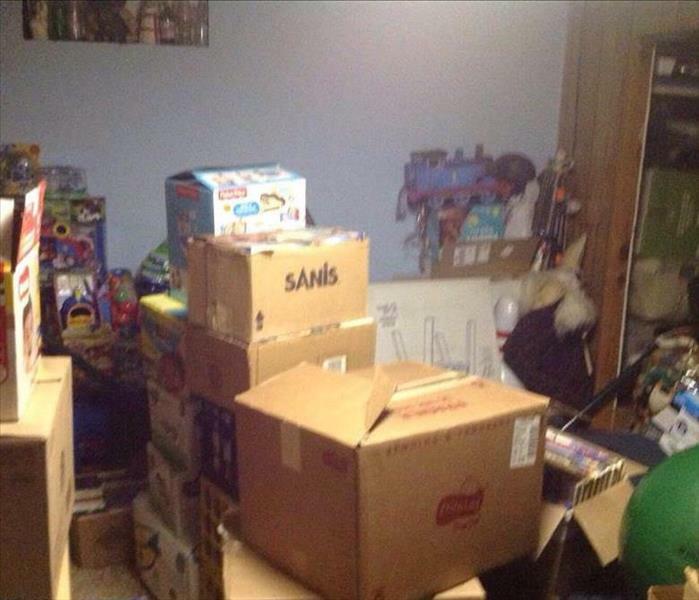 All the contents were packed out and stored until the reconstruction was completed. Once reconstruction was completed we packed in the contents. 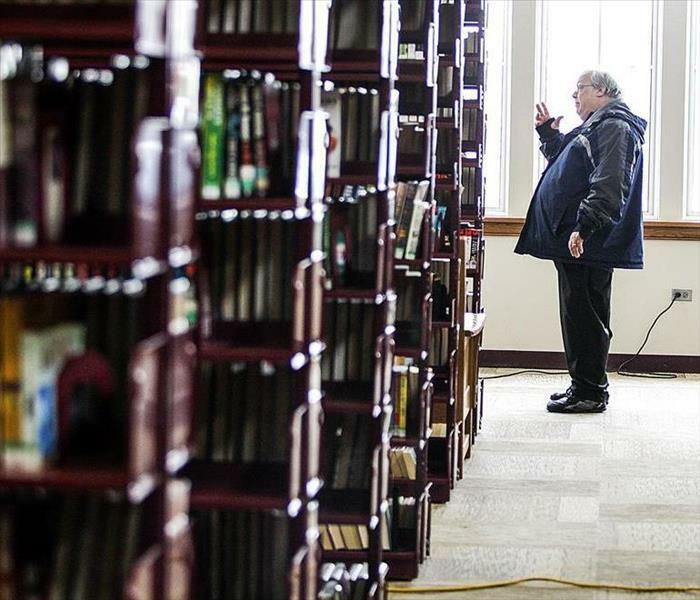 The Huntley Area Public Library was affected by a water damage. The library forced closed due to the extreme cold that ruptured sprinklers. The library spoke persons comment are below. The west side of the building, near the library’s bay windows and the audiobook section suffered the worst water damage, Porsch said. The library’s materials are relatively intact, aside from some damaged audiobooks, CDs and children audio kits. 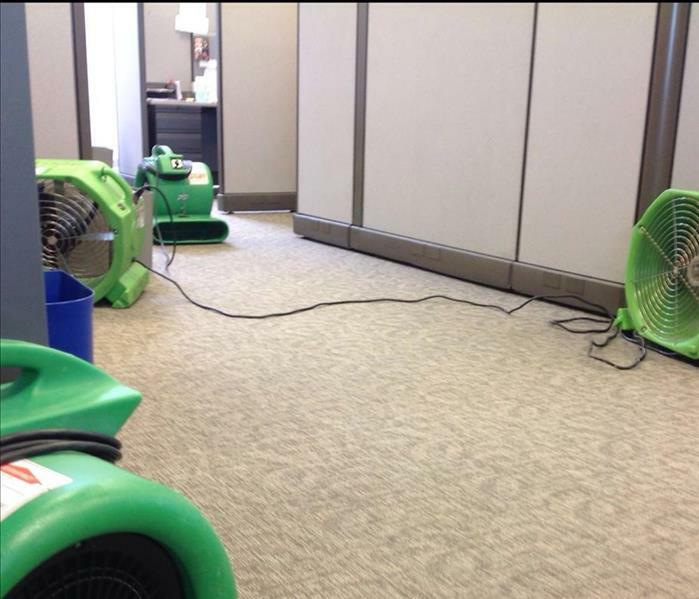 SERVPRO was on site with large fans and dehumidifiers, drying out furniture and the library’s newly installed carpet. We were able to dry everything is 3 days. 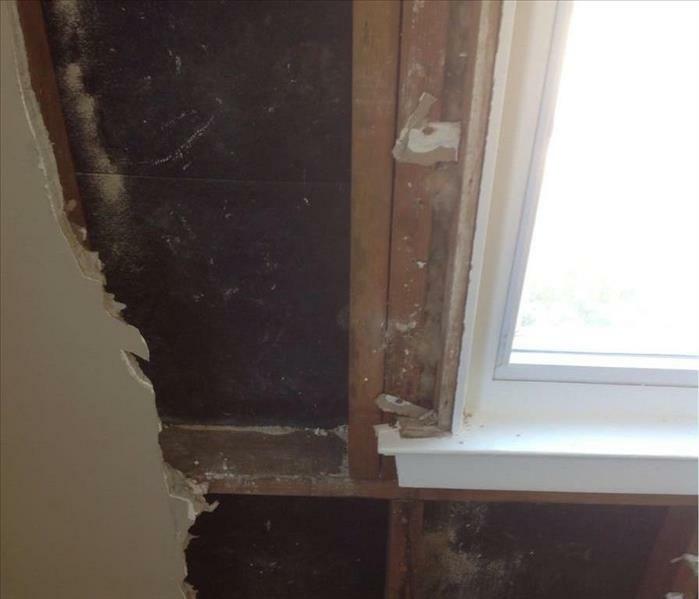 Mold damage at this Crystal Lake home was discovered when we were removing wet drywall from a family room. The home owner waiting too long thinking they could handle the water damage cleanup themselves. 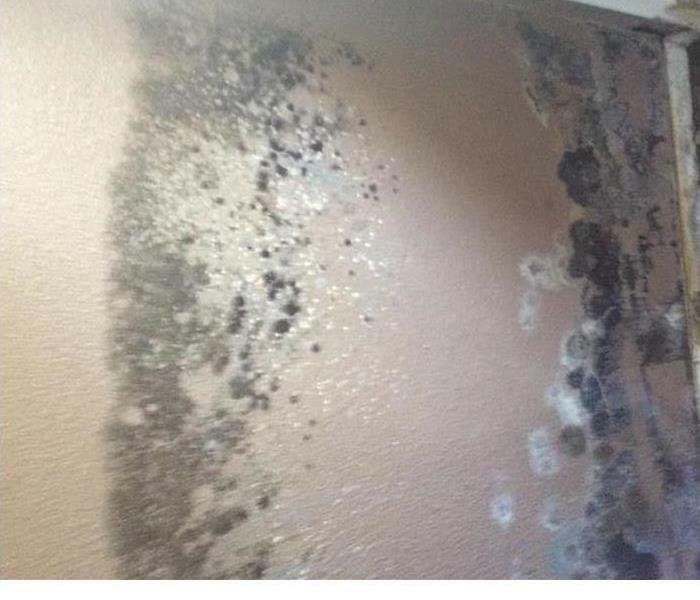 Advanced imaging equipment used by SERVPRO revealed that the mold growth covered most of the wall behind the drywall. The affected wall covering was removed, and the harmful fungal growth was cleaned. We treated the affected area with an antimicrobial and sealed the surface to inhibit future outbreaks of household mold. If there is any hint of mold damage at your house or place of business, call SERVPRO of Southern McHenry County 24/7 at (847) 516-1600. 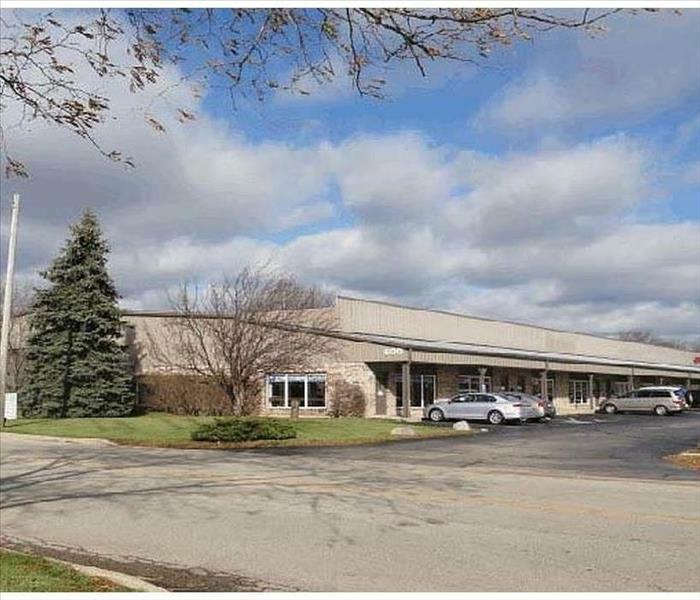 Commercial water damage to 600 Industrial building was caused by a broken sewer line running down the Industrial drive. AT&T years ago had run a telecommunication cable striking a Village of Cary sewer line. It took several years after to finally become blocked. 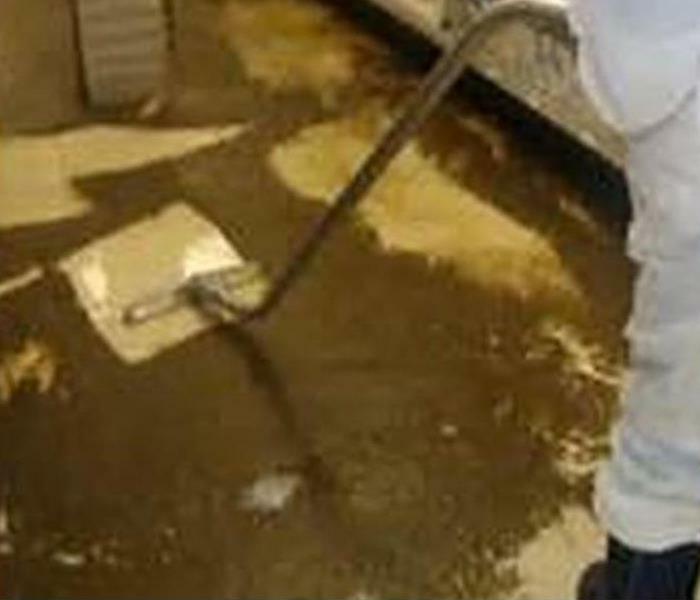 There was sewage coming up in all the units including the SERVPRO of Southern McHenry County unit. SERVPRO came to the rescue going back and forth between the units extracting the sewage from each of the business units in the building. Once the city and ATT resolved the problem. SERVPRO went through all of the units finished up cleaning and disinfecting the affected rooms in each business unit. That day we were really SERVPRO hero’s.